Active and passive interrotron services. The Interrotron, also known as an ‘eye direct’, is a device similar to a teleprompter that is very effective in interview situations or if filming children or anyone who would find it easier to talk to a person rather than a camera lens. It is a ‘must have’ in many interview situations, as rather than seeing text over the camera’s lens, which is what you would normally see on a teleprompter, the interviewee sees the face of the person asking the questions, and is able to respond in a natural way. This is a simple device that uses 2 mirrors to reflect the image of the interviewer standing out of shot. It mounts very easily on professional cameras using an adjustable sliding baseplate. The kit includes a riser for mounting smaller and DSLR cameras on the plate. The director/interviewer sits to the left or right, behind the camera and the adjustable side mirror tilts so that their live image is reflected directly in front of the camera lens. The Passive Interrotron is available for Dry hire and packs up into a wheeled travel case. 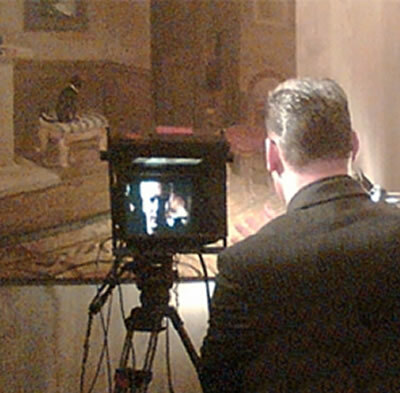 The active interrotron uses one of our autocues, but rather than it showing words, it is connected to a second camera that is filming the interviewer, so the interviewer’s face is projected in front of the interviewee. This set up allows for the interviewer to be in another room or place. 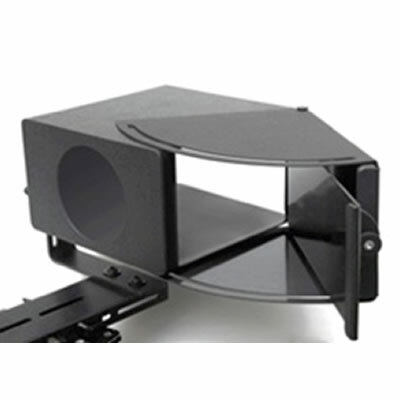 The autocue can be mounted on most cameras and also comes with a separate tripod for mounting off camera. Both the passive and active interrotron are perfect if your subject is nervous about looking straight at the camera and wants to talk to a real person and react to them.